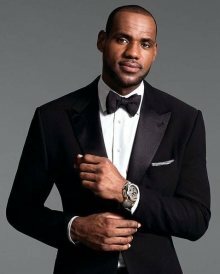 Since turning pro in 2003, LeBron James has made $765 million, according to a Forbes report published in July. He has spent it, invested it and grown it his way – and led to Hollywood. The roots of James’ business empire can be traced to Akron, Ohio where he grew up with a single mother. “My uncles always taught me, they taught me how to have a savings account," James said during an interview taped for one of his own media companies. "They'd give me a dollar and they'd be like, 'Listen nephew, go spend 35 cents of it and keep the other 65. "So I'm always in my head about stashing and keeping my money sacred and to myself because I didn't know when my uncle was going to give me another dollar here and another 50 cents here." At 18, as a high school senior, James no longer was counting quarters. He, his mother and an agent flew to Reebok’s corporate headquarters to hear a pitch for a sneaker-and-apparel deal. During the meeting, Paul Fireman, Reebok’s CEO, wrote a $10 million check – a gift, he explained, if James would agree not to visit Nike or Adidas. “I still can’t believe I left that $10 million," he said with a grin during another interview taped for his media company. He also credited his uncles again, recalling they told him, 'Never put all your eggs in one basket. And give it an opportunity. Give people an opportunity.' "
James met with Nike before and a month before the Cleveland Cavaliers selected him with the first pick of the 2003 NBA draft, he signed a seven-year deal that, reportedly, was worth $90 million, then the most lucrative deal ever awarded by Nike. Two years later James fired his agents, both veterans in the industry, and handed the business reins to Maverick Carter, a boyhood friend of James who at the time was 23. He also hired Rich Paul, also from Ohio, to serve as his agent. Together, the group founded a company called LRMR Management Company, LLC that provided sports and brand management services – and served as a glimpse of what was to come. James also came to befriend billionaire Warren Buffett, who is a friend of Cavaliers owner Dan Gilbert and who met James not long after the power-forward joined the Cavaliers. During a recent interview with USA TODAY Sports, Buffett lauded James for his “money mind." “He can separate out the cream from the crap, and you get more of the latter proposed to you than you do of the former. You really have to be able to suss it out." Buffett said James listened and was thoughtful. A very wealthy human being.